Outliers of Early Cretaceous (Valanginian-Albian) silica sand, kaolin and lignite have long been known in the drift-covered Carboniferous and Triassic basins of Nova Scotia. These deposits are presently mined for aggregate, silica and brick making, and hold the potential as a source for kaolin, used in the manufacture of paper, ceramics and plastics. It was once thought that these outliers were confined largely to sinkholes, and of limited areal extent. Geological mapping by the Nova Scotia Department of Natural Resources and the Geological Survey of Canada led to the realization that these deposits form extensive and deep "hidden" valleys, buried under thick glacial deposits. These valleys may harbour economic deposits of silica sand and kaolin. Results of drilling and seismic surveys in the Shubenacadie and Musquodoboit valleys of central Nova Scotia have indicated widespread distribution of kaolin and silica sand deposits. The Cretaceous outliers have been expanded to basins, from 8 km2 to>60 km2. 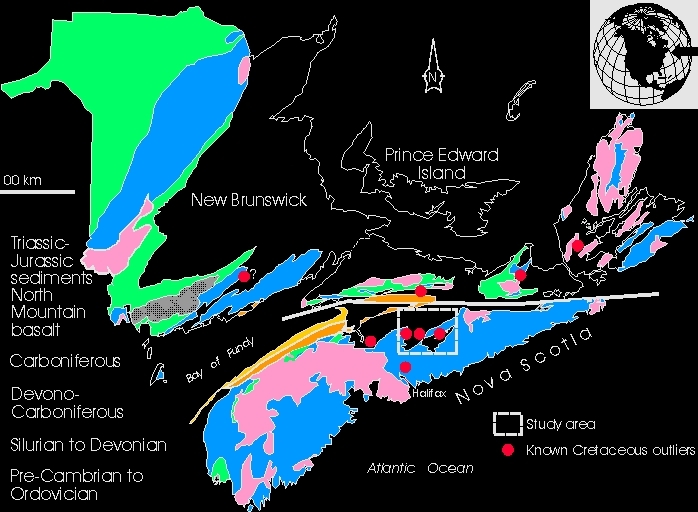 Look at a map of the distribution of known outliers, location of the study area, and generalized geology of Nova Scotia. The photo above is a view facing northward near the town of Shubenacadie at an outlier of Cretaceous sand, clay and lignite, poking up through a cover of glacial till, which forms several large drumlins. (location near drillhole SHU94-2, see geology map. This pit was believed to encompass all of the Cretaceous deposits until drilling on an adjacent drumlin revealed 600 feet of unconsolidated Mesozoic strata. It is truly the "tip of an iceberg" of hidden Mesozoic strata. 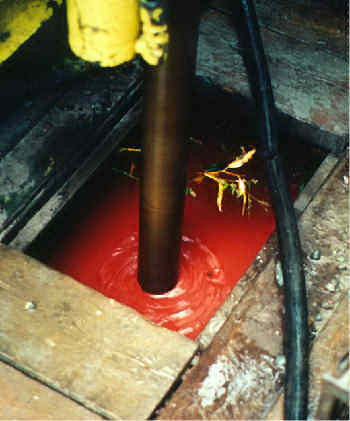 Diamond-drillhole in the Musquodoboit Valley, drilling through red Cretaceous clay. standard rotary diamond-drilling and wireline coring methods. 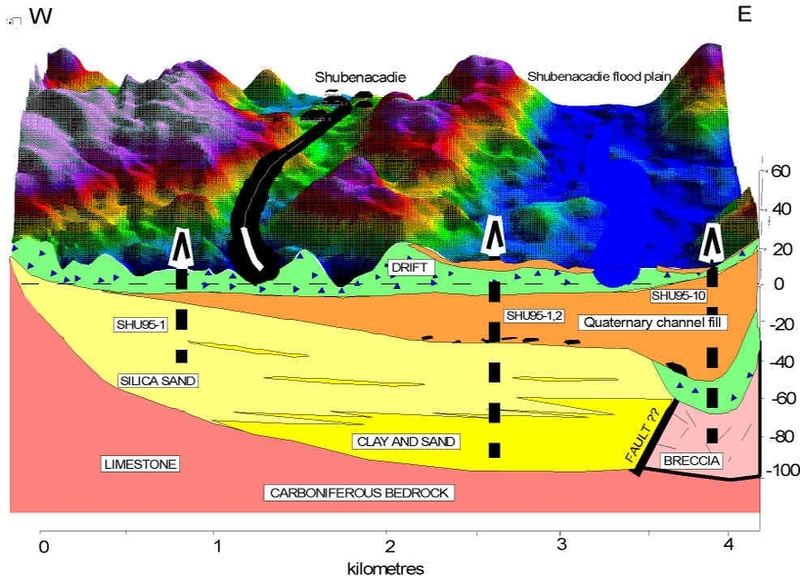 3-D stratigraphic work in the Shubenacadie-Musquodoboit valley study area has shown that several hidden valleys or basins are located in the area. Look at a geology map. The town of Shubenacadie sits on top of the "Shubenacadie Outlier" which is a buried valley of about 10 square km. In the Musquodoboit Valley the Mesozoic deposits cover about 40 km2, and constitute the "Elmsvale Basin". 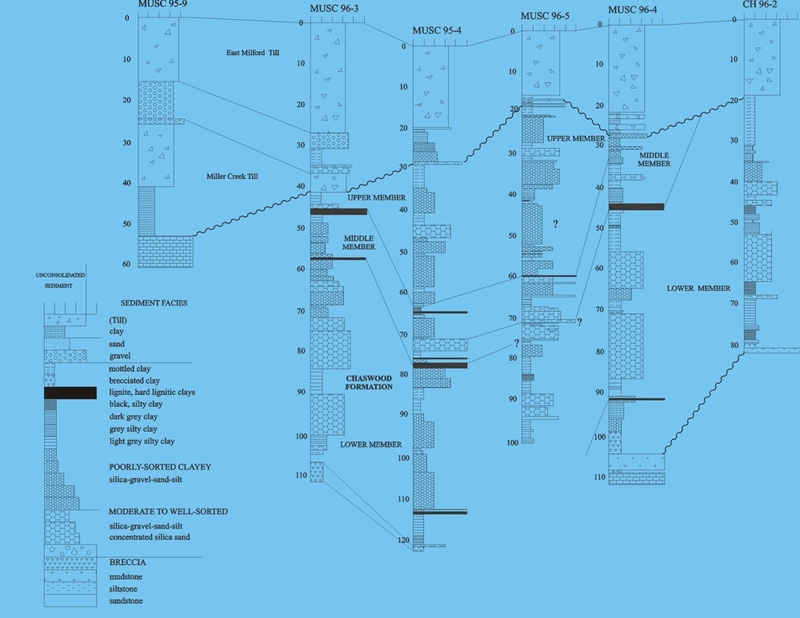 A drillhole profile across the northern end of the Shubenacadie Outlier can be viewed here. 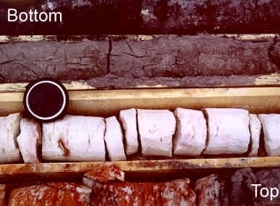 The above photo shows a typical drill core in the Cretaceous Chaswood Formation, part of the drillhole section across the Elmsvale Basin (Musc96-2). The Chaswood Formation consists of quartz-rich gravel and sand, fine-grained kaolinitic and organic clay, and lignite. Three "members" have been defined within the Chaswood Formation, the lower, middle and upper members. The upper and lower members are dominated by inorganic facies and the middle member is characterized by basin-wide lignite beds and organic-rich fine-grained sediments. 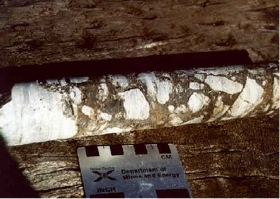 (left) Close-up view of drill core showing Cretaceous clay facies; mottled reddish silty clay, light-grey kaolin and lignitic silty clay. 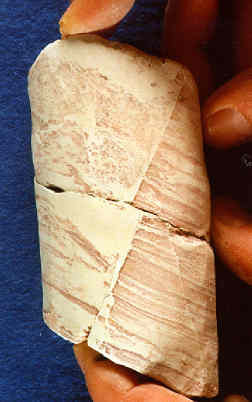 (right) Brecciated clay is found at the base of most cores in the Cretaceous basins. Faults and slickenside surfaces can be found in the cores, indicating that these are tectonic breccias. They grade down core into massive mudstone and siltstone. 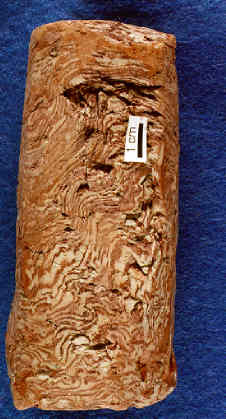 The natural gamma log demonstrates the textural cyclicity of the Chaswood Formation, with oscillations from coarse to fine sediment. 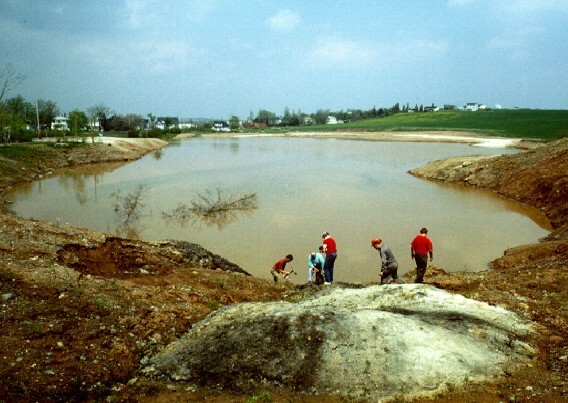 The fine sediment contains potassium-bearing clay and mica responsible for increased radioactivity and higher natural gamma levels. The lack of correspondence between parts of the lithic log and the down-hole record can be attributed to poor core recovery in the sand. 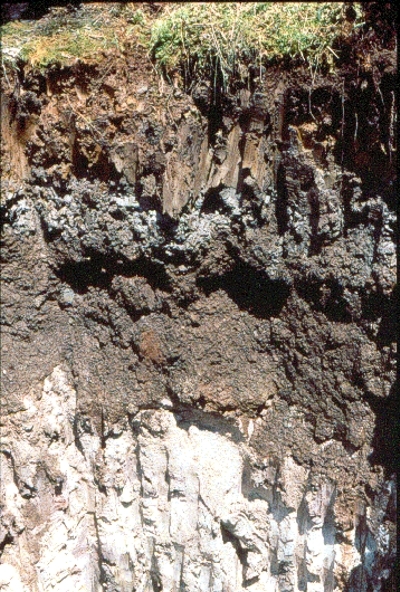 The lower member of the Chaswood Formation is characterized by lower frequency oscillations and thicker sand-clay beds. The middle member can be differentiated by zones of lignite and pyrite with higher radioactivity and conductivity. The upper member reveals a higher frequency grain size fluctuation. The contact with uppermost Quaternary sediments is marked by an increase in magnetic susceptibility, reflecting the abundance of magnetic heavy minerals in the Quaternary sediments. The Chaswood Meadows seismic line is a north-south profile across the Elmsvale Basin approximately 2.5 km in length. Depth scale is in metres above and below mean sea level. Click on the image for a full interpretation with drillholes superimposed. An asymmetrical, smaller channel at the south end of the line, cut into Cretaceous sediments, approximately 1 km wide and 50 m deep, filled with Quaternary sediments (Units 2-4). 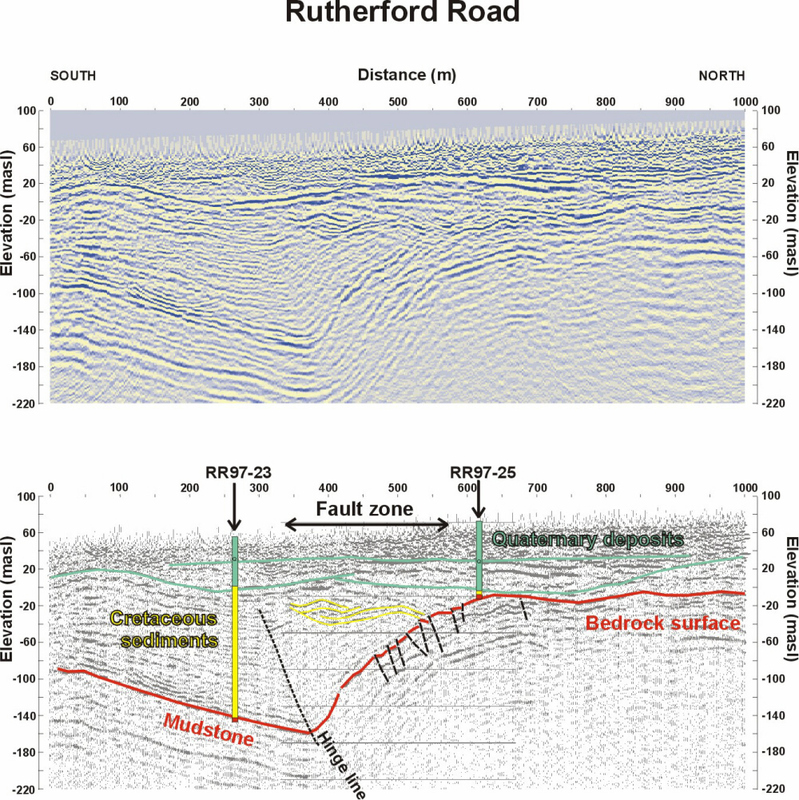 A fault zone (Rutherford Road Fault) has been mapped at the northern margin of the Elmsvale Basin. South of the fault the Chaswood Formation is 140 m thick. Bedrock and Chaswood Formation reflectors terminate abruptly at the fault zone and as much as 100 m of dip slip are indicated. The fault zone exhibits several structural styles, including fault-related folds and possibly reverse faults. 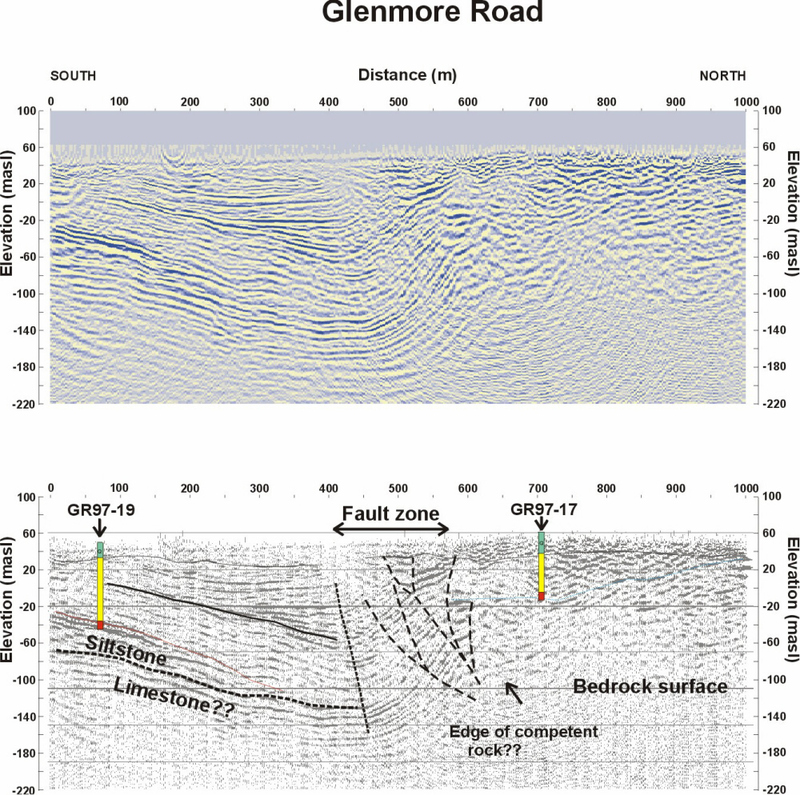 The Glenmore Road transect displays a marked structural discontinuity from gently dipping Cretaceous sediments to the south to steeply dipping folded and faulted strata across the fault zone. The Rutherford Road transect seems to show mostly folded Cretaceous strata adjacent to the fault. Cores in the vicinity of the fault zone near Glenmore Road shown on the photos on the left and right reveal both brittle (L) and ductile (R) deformation. The Chaswood Formation is interpreted to be a terrestrial fluvial deposit. The upper and lower members of the Chaswood Formation consist of bar and channel sand-dominated facies with distinct fining-upward sequences and overbank clay-dominated units. The middle member, by contrast is dominated by organic-rich, fine-grained sediment, and interpreted as lacustrine. Note the angular unconformity between the dipping Cretaceous sediments and the glacial till. See a schematic cross-section and digital terrain model of the southern portion of the Shubenacadie outlier. A "hidden" Cretaceous valley is buried beneath a drumlin field and glaciolacustrine deposits. Thick deposits of brecciated clay are found adjacent to the basin, underlying glacial lake sand and clay, suggesting a fault contact. The Cretaceous and Pleistocene sand deposits have been evaluated as a potential aquifer for the Town of Shubenacadie. 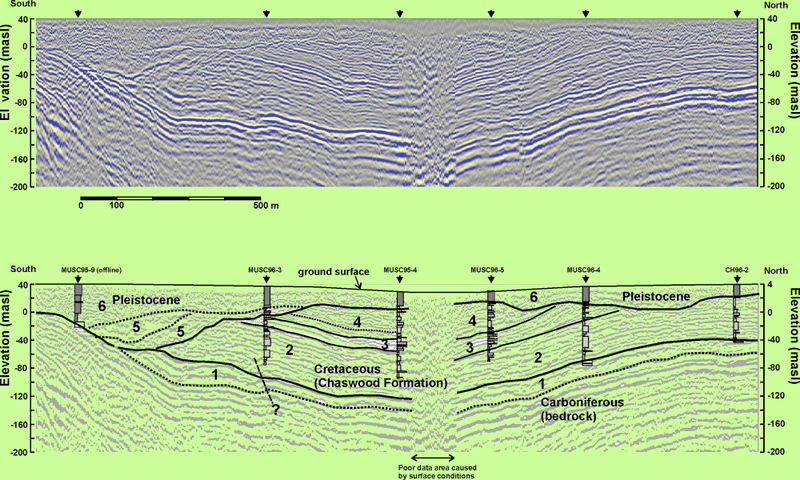 Deposition of Early Cretaceous sediments in a low-moderate relief fluvial environment. Weathered bedrock in muted upland areas feeds the river systems providing kaolin and quartz. Approximately 1 km of Early to Middle Cretaceous sediments were deposited over Carboniferous strata. During the Middle Cretaceous movement along re-activated basin faults creates structural valleys and results in the exhumation of Acadian orogenic strata beneath Cretaceous and Carboniferous overstepping strata and transport offshore. Tertiary uplift and denudation further modifies Middle Cretaceous structural basins. 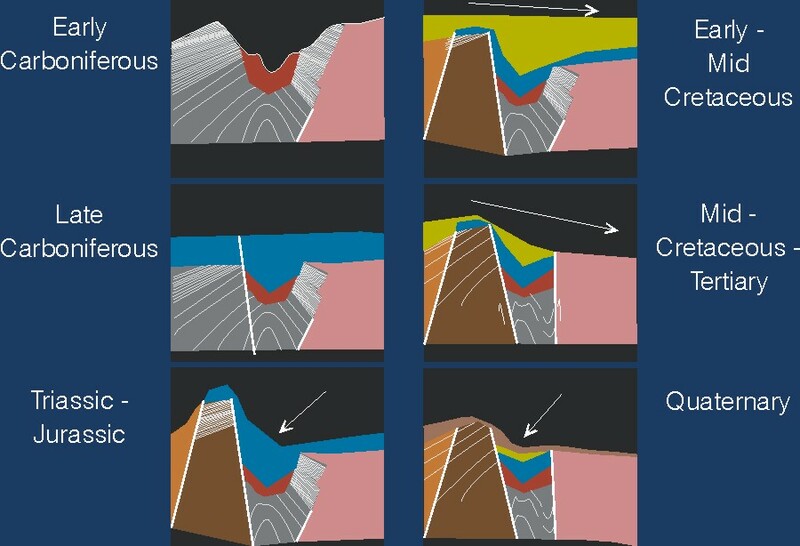 Quaternary glaciers modify and selectively erode Cretaceous structural valleys. Lakes are impounded in these valleys during ice advance and retreat resulting in "hidden" Mesozoic valleys buried under glacial till and glacial lake sediments. See a series of cartoons illustrating the "structural-exhumation" hypothesis of landscape formation. 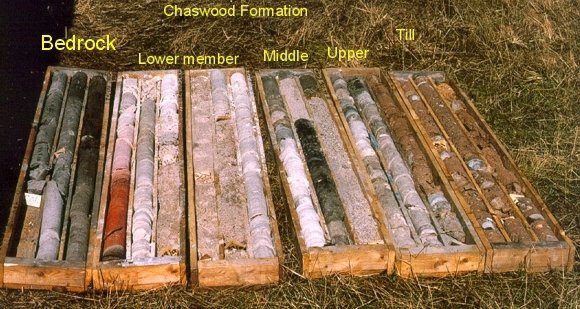 Sediments of the Chaswood Formation have many industrial mineral uses and are presently being mined for brick clay and silica sand. 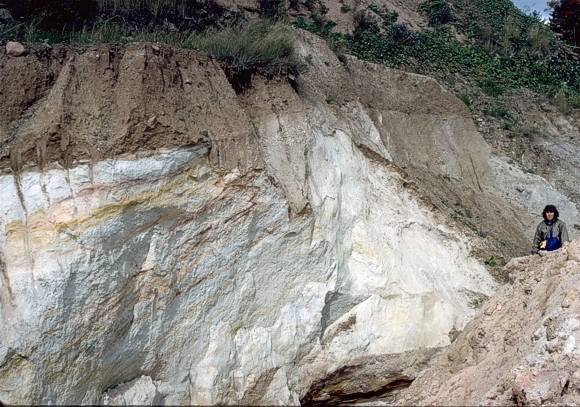 The photo on top shows light-grey kaolin within 2 m of the surface in Middle Musquodoboit, Nova Scotia. Kaolin found in the Chaswood Formation has the potential for use in the paper industry. Kaolin has a wide variety of industrial uses such as fillers and coaters in the manufacture of paper, ceramics, paint, rubber, flooring, fibreglass and pharmaceuticals. The suitability of kaolin for a particular application depends on its physical properties. For use in the paper industry, by far the most important application, properties such as whiteness, brightness and grain size are paramount. These properties can be improved by beneficiation techniques, including magnetic separation of impurities, chemical leaching, delamination (breakdown of kaolin crystal stacks) and calcining (heating to 1050 degrees to burn organics). Brightness is a vital property for paper-grade kaolin, and is measured as a percentage of reflectance using a BaSO4 standard. 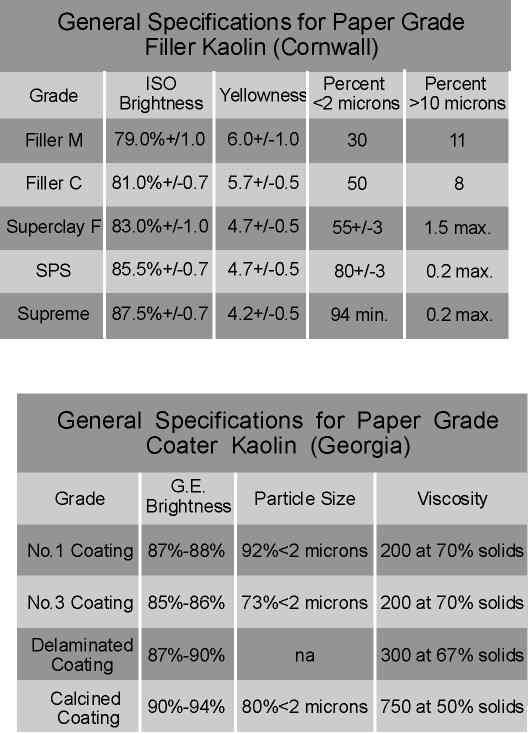 Some of the specifications of filler and coater grade kaolin can be viewed here. 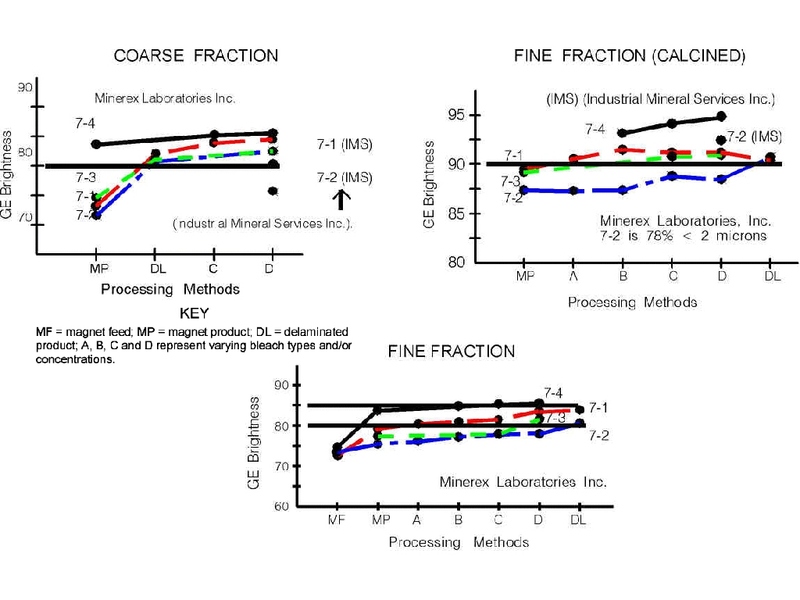 Processing of a coarse fraction (grain size range from 30% to 72% less than 2 microns), yielded G. E. brightness values ranging from 75% to 85.5%. These test results on a selected few samples demonstrate the potential for the production of a Filler M type kaolin product along with a wide range of other coarse filler products. Process results on kaolin samples 7-1 to 7-3 from trenches near that pictured above did not yield brightness values (see table) meeting requirements of fine-grained standard coater products. A sand-rich sample 7-4 (grain size of 39% less than 2 microns, however, exceeded these values without delamination and/or fractionation and has the potential to produce a product with brightness approaching 90%. A crucial limiting factor in coater products is the viscosity of the clay-water slurry. Initial Brookfield viscosity measurements in Nova Scotia sedimentary kaolin were between 800 and 2400 cpe at 68% solids. Calcined kaolin was produced from these initial samples with G. E brightness values up to 94.8% and superior whiteness values. Nova Scotia kaolin exhibits excellent potential for calcined kaolin applications. Kaoclay Resources Inc. has been conducting exploration and development drilling in these hidden basins for several years. They have further developed processing techniques for Nova Scotia kaolin and have improved both brightness and viscosity values. New discoveries of Cretaceous sediments near Shubenacadie, Nova Scotia; In Nova Scotia Department of Natural Resources Minerals and Energy Branch Report of Activities 1994, Report 95-1, p. 139-158. Processing results from kaolin deposits in Nova Scotia, Canada; In 33rd Forum on the Geology of Industrial Minerals; Quebec, Canada; eds. Marc Bélanger, Thomas Clark and Henri-Louis Jacob; Canadian Institute of Mining and Metallurgy, Special Volume 50, p. 163-170. Mesozoic stratigraphy and kaolin exploration in the Sibley Road area [NTS 11E/03], Halifax County; Minerals and Energy Branch Report of Activities 1999, eds. by D. R. MacDonald and K. A. Mills; NSDNR Report ME 1999-1. p. 40-45. 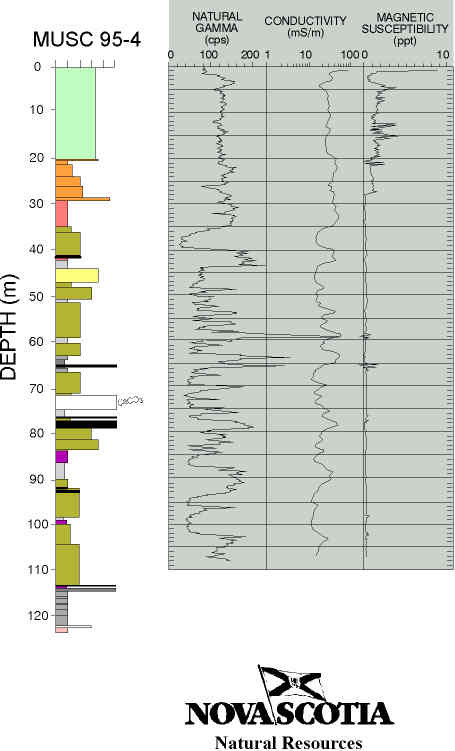 Seismic exploration for Cretaceous kaolin deposits in glaciated terrains: Example from Nova Scotia, Canada; In SAGEEP'97, Proceedings of the Symposium of the Application of Geophysics to Engineering and Environmental Problems, March 23-26 1997, Reno, NV, v. 1, p. 133-142. Cretaceous deposits of kaolin clay and silica sand in the Shubenacadie and Musquodoboit valleys, Nova Scotia, Canada; Nova Scotia Department of Natural Resources; Mines and Minerals Branch; Open File Report, 96-3, 102 p.
Go back to the chopper (virtual field trip home page) or Reading Room 3: R. R. Stea, your pilot and author.